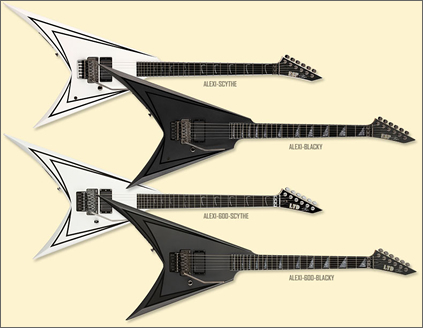 Created for Alexi Laiho of Children of Bodom, this series comprises 5 models, similar to the Jackson Randy Rhoads model in style. The difference between the Alexi-Blacky and Alexi-Scythe models is basically the finish. The Blacky is a fairly recent model with a matt black finish and gloss black pinstripe. The Scythe is the earlier Alexi Laiho model, still available, with a white finish and black pinstripe. Don’t forget to pick up our FREE SIGNATURE GUITAR EBOOK!